Look closely and try to determine what manner of creature that orange blob is. Is it a soft coral? Perhaps a misshapen echinoderm? Is it some weird growth? Look again and make a guess. Now, do you see the tail fin sticking up? How about the pectoral fin planted on the rock like a foot? Getting a sense of it now? It's an anglerfish in all its camouflaged glory. Have fun staring at it for a while longer. In the mean time, be grateful that this fish doesn't have any man-sized terrestrial equivalent. fish are *sooooo* cool...i love the way they do that! i am also greatful that there is no large human-sized equivilant...i would SO be a gonner. Stone fish or scorpion fish. Probably poison. Whatever the case, it's pretty cool! I feel like it's almost certainly not an angler fish, since there is a lot of light in the photo and the surroundings suggest a tropical location. If nothing else, this was taken in water no deeper than 200 ft. As I understand it, angler fish are deep bottom dwellers. The photographer identified it as an angler fish. 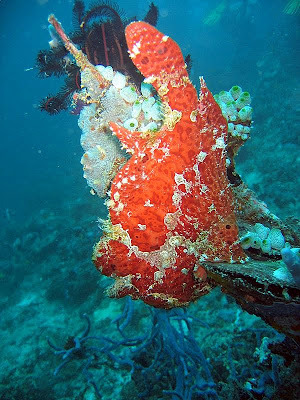 It looks like a frog fish to me, and frog fish are angler fish.